Isabella's Project Diary: HSF #8: UFO! The back was inspired by this jacket at the V&A. There is also one in Williamsburg with a very similar tail. So, the full story of this UFO is a LONG one. It begins back in the 20th Century when I was learning to sew. I had made one dress for Easter (out of oh so proper lining satin!) and I think *maybe* another 1950's inspired dress when I decided to go digging through Mom's stuff in the attic. I found some lovely linen floral with swirlies that declared to be my next sundress. Well, at this point in time I knew nothing about pattern sizing, mocking up, or really anything other than cut out pattern and follow the directions. According to the pattern, I needed to cut out a size 14. Therefore, that is exactly what I did. I sewed it up, had really cute pink buttons down the front, and found that I had made myself a very lovely tent. Being very new to the whole sewing thing, I figured it just needed to be taken in a bit. And a bit more. And maybe just a bit more. In total, I tried to take the sundress in six times. I gave up after that and it languished in the UFO pile for many, many years. It's interesting to note that each time I took it in, I didn't cut off the excess. This became important in the 21st century when I stumbled across it again - ten years later. I took one look at the fabric and did an "OMG!!!!!11!!!" 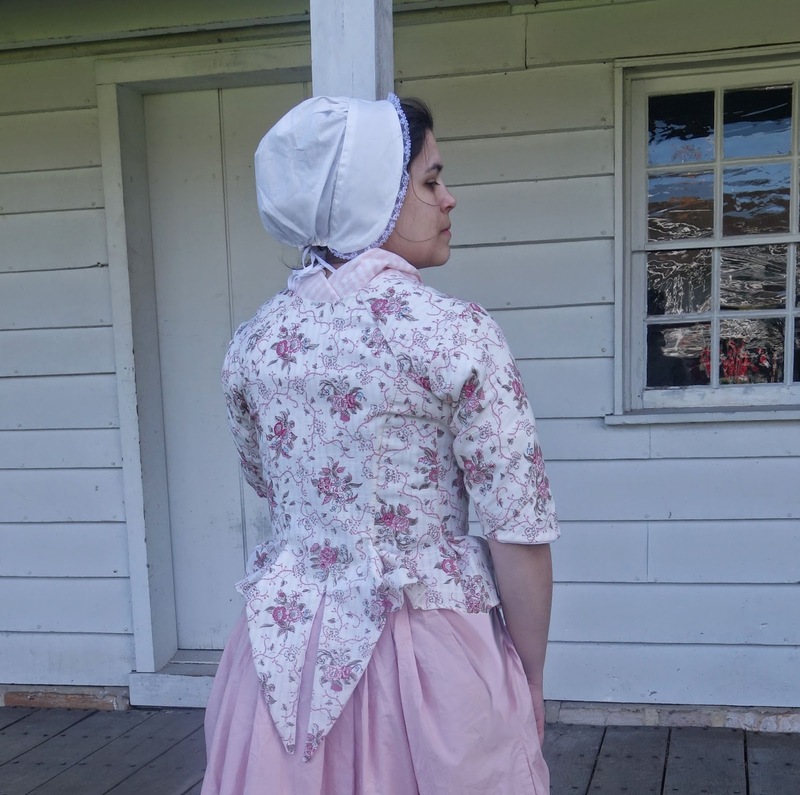 I realized how dumb I had been and that the fabric of the sundress was perfect for 18th century. Although I no longer had enough to make a dress, I did have enough to make a jacket. So, back in the pile it went with plans to, eventually, take out all the crazy stitches and use the pieces of the sundress to piece together a jacket. In the picture below, from left to right, front panel left, front panel right, back panel, front side panel. There is also a back side panel (seriously, this thing was a tent) but I had that to the side since it was just right for the sleeves. This picture shows the body pieces I draped in this post. Here's the back side panel with the sleeve pattern I drafted in this post. Of course, I knew making something from an already made garment meant some piecing. I had to piece the elbow flap of the sleeve - which is period. All I did was once I cut out the top part of the sleeve, I took the extra piece of fabric and placed it where the elbow flap was missing. I overlapped the fabric slightly to give me a seam allowance. This is the fabric of the sleeve completely cut out. You can barely tell in the photo where it will be pieced. Cutting out the lining next! I just used scraps I had on hand. The aqua is cotton and the white is linen. This is just the back and the sides of the body as I was sewing them to show the overall shape. How historically accurate is it? 80%. I did machines stitch some of the inside seams but all the visible stitching is by hand except the button holes. 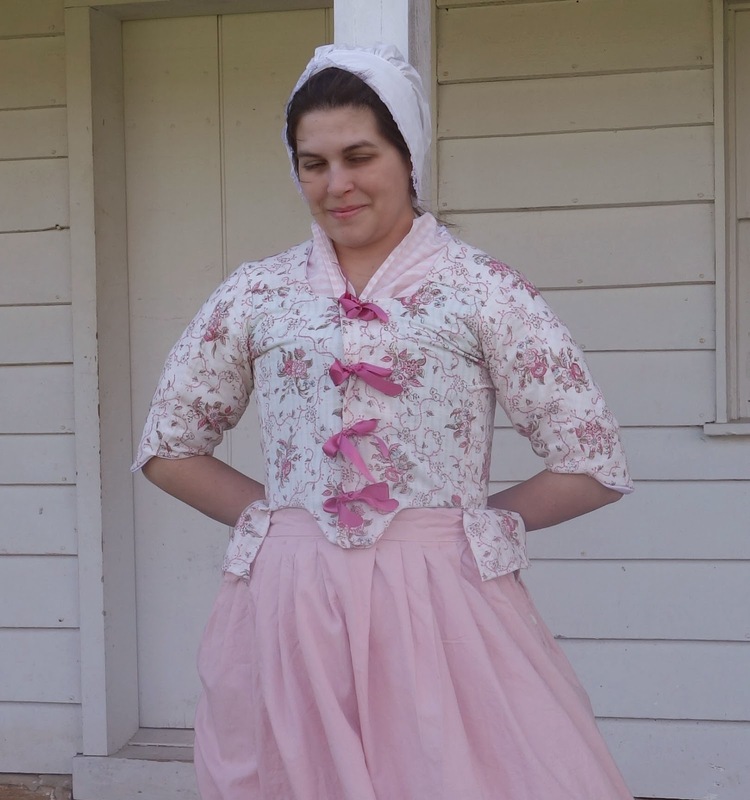 The sundress had button holes and the original plan was to make this a button jacket. However, I thought it was too small (it wasn't) to make into a button front so I did machine button holes on the other side too and planned on tying it shut with ribbon. The jacket did fit correctly though . I ended up tying ribbons around one set of button holes and just crossing the front over and pinning it. Hours to complete: Maybe 6? Total cost: $5 for the silk ribbons. Love the colors of the jacket. Kidney Beans and Rice is totally medieval!